An alternate title for this post might be “Who’s Afraid of the Mona Lisa?” You see, I have a confession to make: I once spent nine months in Paris without once visiting the Louvre. And although I was twenty years old and a clueless college student, that’s actually not the reason I stayed away; I’ve always loved art museums and spent untold hours while I lived in Paris in both the Musée d’Orsay and the Musée Rodin. No, the simple fact is that I was intimidated: By the sheer vastness of the building, by the crowds that always surrounded the I.M. Pei pyramid in the courtyard, by the prospect in those pre-Internet days of trying to figure out what best to see once I was in there. What’s to be afraid of here? And when I returned with my family nearly twenty years later, I still didn’t have to overcome my fear. 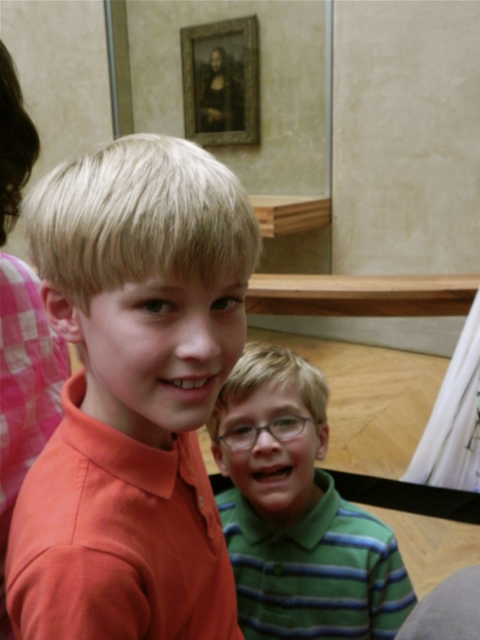 After all, I was visiting Paris with a three- and six-year-old – no one expected us to tackle the Louvre. So instead, I took my older son to the Musée d’Orsay, my comfortable former haunt, and gave myself lots of pats on the back for helping him interpret Manet’s Déjeuner sur l’Herbe and inviting him to photograph the sculptures there as a way to engage him with the art. But when we returned to Paris at the end of June in 2012 and the boys were seven and ten, I knew that time was running out on my excuses. I had been blogging for years and had an audience that relied on my advice, especially for visiting museums. The Louvre is one of the world’s major cultural landmarks, the most visited museum on the planet. I needed to put on my big girl pants and join the over 28 thousand people who visit it every day. So I girded myself, did a lot of online research, and picked a date. It was Louvre-with-kids go time. There are multiple entrances to the Louvre, and I did figure out that going in through the Pyramid in the outer courtyard is the worst possible way to get into the museum because it’s the most obvious and therefore has the longest lines (visitors must go through security at every entrance – the lines are worse for that than for tickets). Word on the Internet was that the Porte des Lions entrance was the best way to avoid lines because no one uses it. I think that no one uses it because they can’t find it. I’ve since found this post describing precisely where it is and would definitely give this a try next time. Since I couldn’t figure out quite where the Porte des Lions entrance was, we chose to get into the Louvre via the underground mall that is immediately adjacent to the museum’s Metro stop. Although we arrived fairly early in the morning, about a half hour before the 9 a.m. opening, we still discovered that the line stretched well out into the mall, a babelian sea of humanity. Do you think I look tense? I’ll admit to an immediate desire to flee, although the line actually moved quickly. But the fact that we had to wait at all confirmed every fear I had about the Louvre. I’ll admit also that I was perhaps somewhat snippy while we stood in line. And I may have been unhappy when after the automated kiosk charged our credit card but then refused to print our tickets. Happily, an attendant appeared almost immediately and solved the problem. All told, the entire experience took about 45 minutes. At long last, we were inside the Louvre. 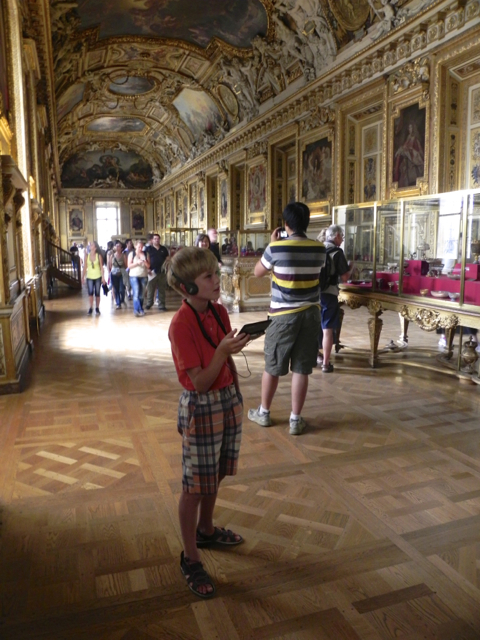 In 2012, the Louvre replaced its more traditional audio guide system with an interactive tour that operates on a Nintendo DS. We were there shortly after the Nintendo guides were introduced and both of my sons were excited to try it, an auspicious beginning to our day at the museum. We decided to take the highlights tour, which guided us past the palace’s original medieval moat into the rooms containing Greek and Roman antiquities. Our first major stop was the Venus de Milo. 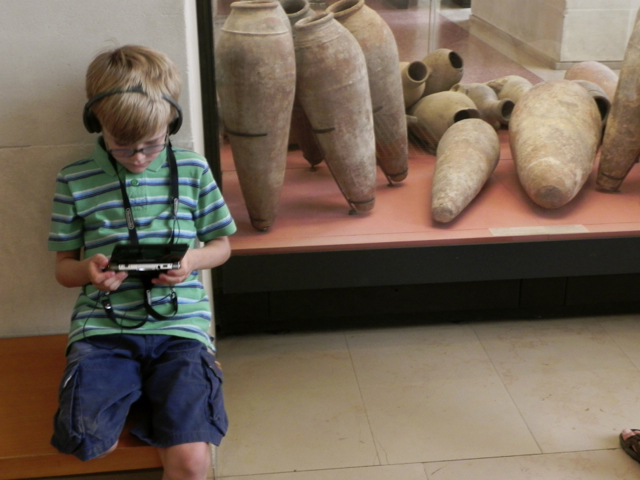 Ten-year-old Tommy was diligently listening to the guide and informed us that the statue is famous because unlike many other sculptures in the collection it is not a Roman copy of a Greek statue but is actually Greek and is more than 2000 years old. We spent a long time in the adjacent sculpture galleries, especially the Salle des Caryatides, a delightful surprise full of many lesser-known statues that are lovely illustrations of Greek myths, which both my boys had studied in school. Be warned, however, that if you have an especially observant child, you’ll find yourself having to explain why a boy might strangle a goose and what a hermaphrodite is. 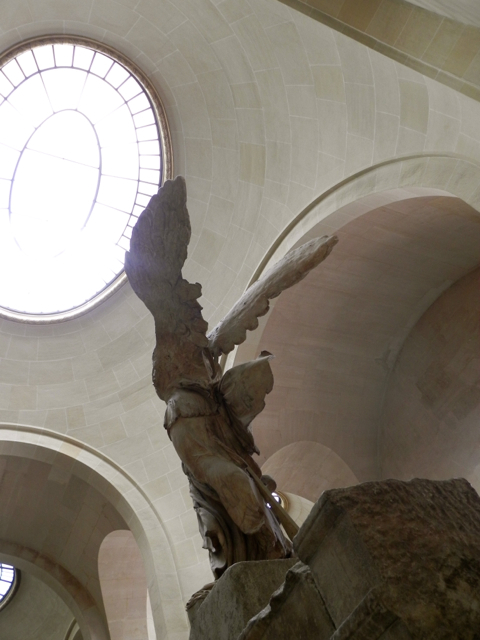 Next on our tour was the Winged Victory of Samothrace which is, like the Eiffel Tower, impossible not to love no matter how clichéd or photographed it may be. My favorite movie of all time is Funny Face, and I’ll admit to teenage fantasies of myself dressed in an evening gown and descending the stairs that lead up to the statue à la Audrey Hepburn. The crowds surrounding Victory were fierce (although she’s got nothing on the Mona Lisa) and it made me a little sad to see how many of the herds of people who marched determinedly through the museum stopped for ten seconds to snap one picture of her, from one angle, before moving on. I actually discovered that it’s possible to walk around behind her. For a few short moments she and I enjoyed each other’s company as if no one else were there. She is now under restoration until the summer of 2014; which makes me doubly glad to have visited so closely with her. Most of the crowds headed from Samothrace inexorably toward the Mona Lisa’s siren call, but we made a detour into Louis XIV’s great and much gilded Gallerie d’Appolon, which Tommy wanted to study in great detail. Yes – it’s blurry. I’m pretty sure that’s because someone bumped into me. My triumph was complete. It wasn’t until afterwards that I realized there is in fact no documentary evidence of the fact that I was there and saw the Mona Lisa too. You’re just going to have to take my word for it. After a long break for lunch, the boys voted to take their DS guides on a tour of the Egypian antiquities. I appreciated the bits of information he fed me, and although I may not have gotten the full historical background on everything I was looking at the aesthetics were impeccable and enormously pleasing (oh, how I love the French eye). 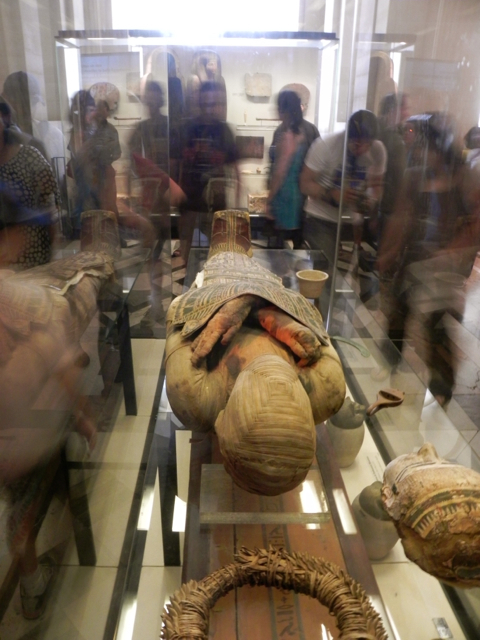 We’ve seen mummies before in both New York and London, but there was something extremely dramatic about the way the Louvre displays theirs. 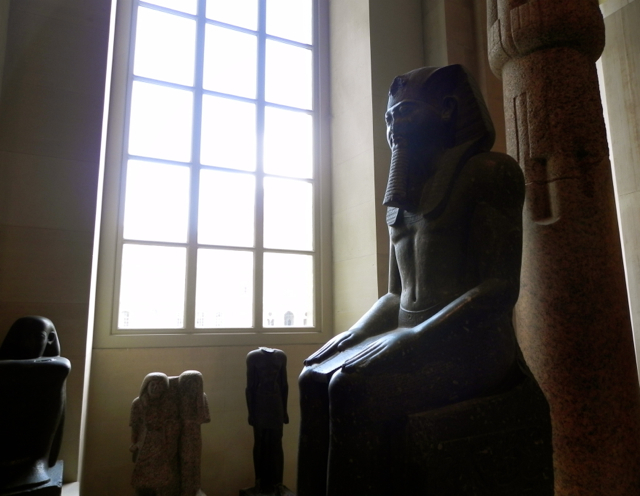 The Egyptian collection at the Louvre is enormous, and although we probably spent about two hours exploring, made I through only about half of the rooms before all of us felt it was time to leave. Did I feel a little sad that I left the Louvre without seeing its amazing collection of Renaissance paintings or decorative arts? Not really. Our visit was so much more fun than I had expected it to be, so full of delightful surprises, that I had no regrets. And the most important thing is that I’m no longer afraid of the Louvre. I know I’ll be back to explore its treasures again. Although I was compensated by Michelin Guides for writing this post, they did not pay for any of my travel expenses on my trip to Paris. You can always count on me to tell you when I’ve received something for free and to share my honest opinion. 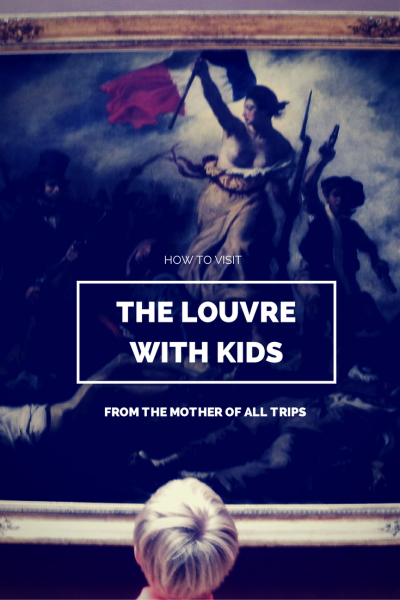 I did not have a Paris Museum Pass for our visit to the Louvre because we weren’t planning enough museum visits on our trip to justify the expense; you might consider this option, depending on what you are planning to see with your family. Advance tickets for the Louvre are available online at various locations. I’m not sure that buying advance tickets to the Louvre actually saves you much time though, because you still have to go through security, which was certainly the longer portion of our wait. Our children really enjoyed the Nintendo tour, although Matt and I both had a hard time figuring out how it worked (and even the boys got lost and couldn’t get back to where they were in the system when they stepped off the guided trail it was leading them on). I wouldn’t recommend renting these for the entire family because using them requires wearing headphones. 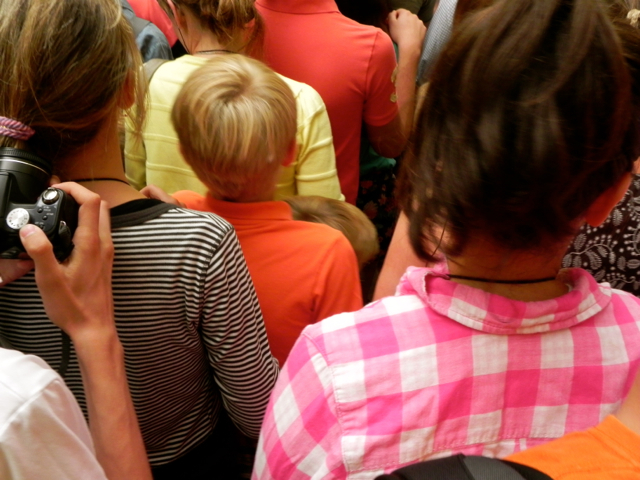 It was so crowded that I felt it necessary to pay my full attention to both children so that I didn’t lose them. It’s also important to be mindful of your wallet – the Louvre has recently seen a rash of pickpocketing incidents. There is now a Louvre smartphone app – you can bet I’ll be downloading that to my phone before my next visit. Although I can’t imagine visiting the Louvre and never seeing the Venus de Milo, Samothrace, or the Mona Lisa, I definitely wouldn’t want to go there and see only those things. Now that we’ve been once, we will definitely return and check out some of the other (less-visited) exhibits. 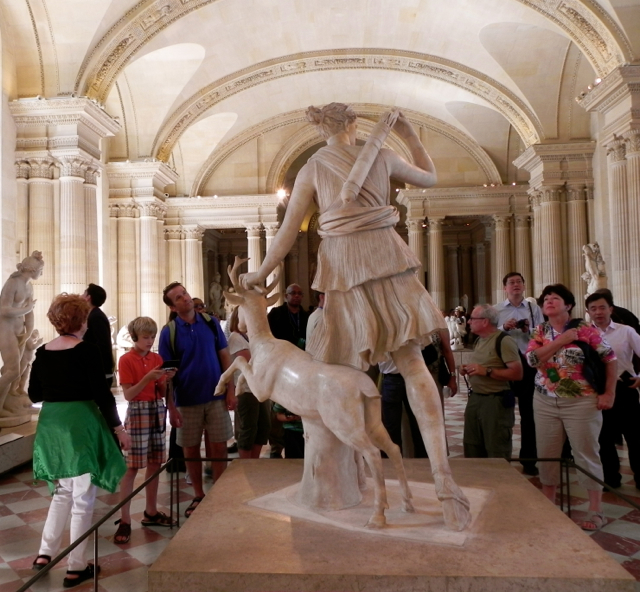 There are excellent, if expensive, tours available of the Louvre from companies like Context Travel. I would definitely consider budgeting an in-depth Louvre tour as part of our travel expense the next time we are in Paris. At lunchtime we enjoyed a picnic in the adjacent Tuileries Garden. Once you have a ticket, readmission is snap (we also had no trouble turning in and picking up audio guides) so I definitely recommend getting outside for some fresh air mid visit. The nearby Jardin du Palais Royal is the perfect spot for a quiet post-museum snack and beverage. Please see Paris in its proper order if you’re interested in a chronological list of posts from my family’s July 2008 trip to Paris, or visit my Paris page, which lists all of my stories and tips about my favorite city. If you enjoyed the photos in this post, please “like” The Mother of All Trips on Facebook where you can view even more; or follow me on Instagram. 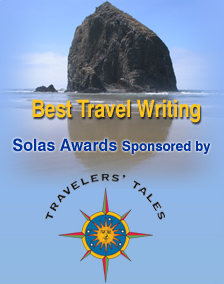 And finally, whether you’re reading this post using my RSS feed or are a first-time visitor, I hope you’ll consider subscribing to the Mother of all Trips via email. Signing up for email updates means you’ll never miss a post. 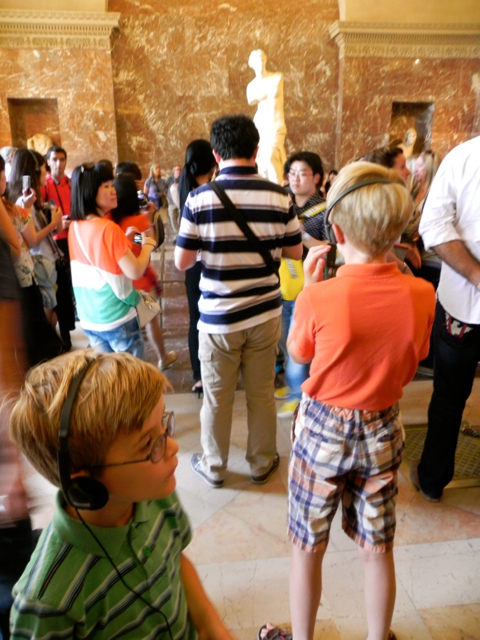 The Louvre is intimidating, especially with kids. I am shocked to see the crowd in that room! Glad you and your kids enjoyed your visit. That crowd is crazy! 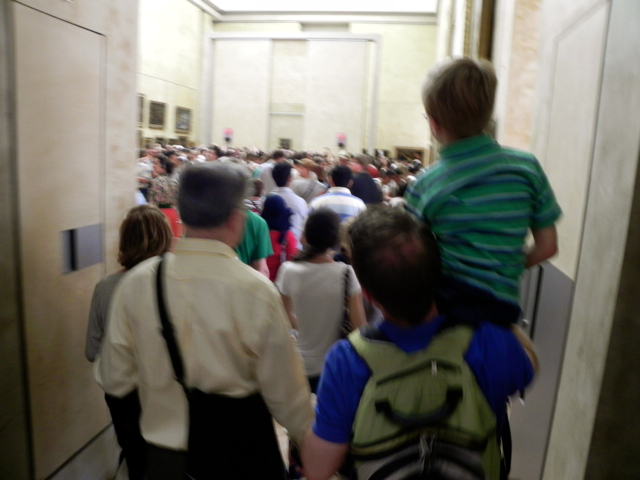 We visited in March and it was busy but nothing like that – I’m not even sure that Emma could have maintained her level of enthusiasm for seeing the Mona Lisa if we had run into that many people! I agree completely about the Context tour experience – we have toured the Vatican Museums and the National Gallery in London with them and it enhanced our experience so much that I would likely book a tour with them if I was returning to the Louvre. Love this post! 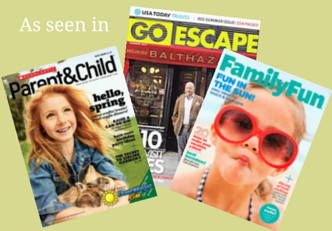 Adults love to see these things (museums, historical sites, etc. ), but it is easy to forget that children can enjoy them as well. I think the best thing to do is to browse the collections online before you go and settle on just one or two wings to focus on (I enjoyed the Iran section in particular during my first visit)..Otherwise you might get hit by a sense of burnout very easily. And it would be a real shame not to enjoy a place like Louvre to the fullest. 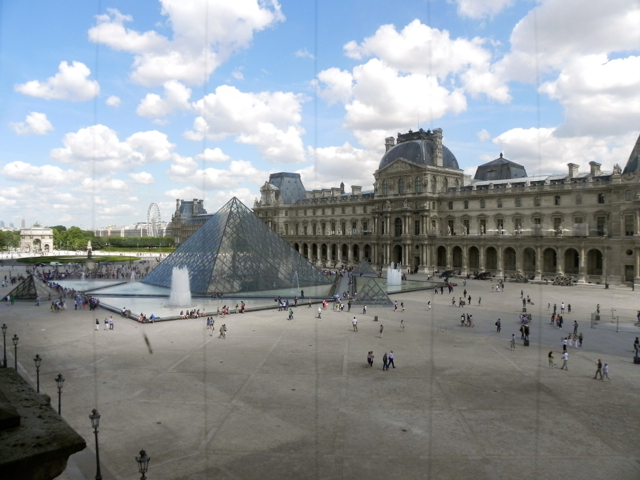 Last year I was in Paris and Louvre was never missed as we spent almost a day there. Mona Lisa was course our MUST see paintings besides others. But the painting, which looked rather smaller than what we see in photos, looked alone on a huge end wall. I loved moving about and saw with interest the Micheal Angelo’s Rebellious Slave and the the Dying Slave, beside the Cupid’s Kiss and the white Greek marble Statues `Satyres de Atlante.’ The Egyptian section was certainly fascinating and so was Iran’s (having lived in Iran for over a year attracted me to this section). Would go there again someday to see what I could not see in a day. I would like to ask -there is and information-kids’ entrance is for free- how does it work? Children under the age of 18 are free – you just bring them along. We did pay for the guides that our children used however. From October until March the entire museum is free on the first Sunday of every month, but you are advised to get their early as it is often quite busy. Thanks for the greetings and the question! Hi there. 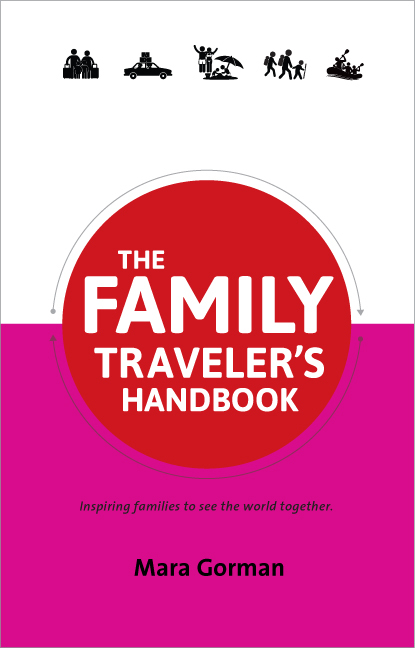 I’m so happy to read this post, as am in the middle of planning a 6 week France and Portugal trip with our 8 and 10 year old! 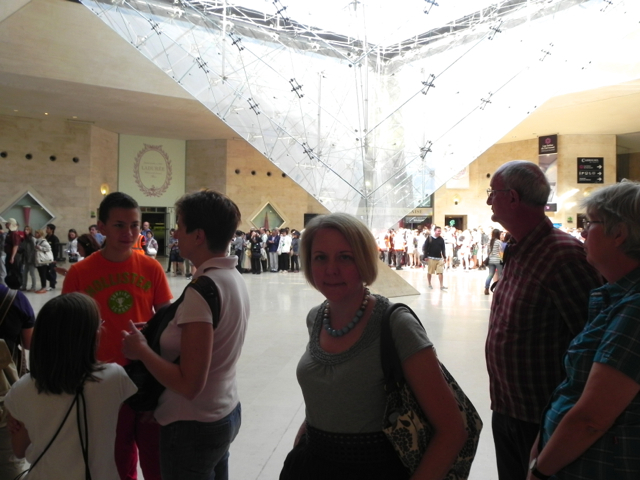 The Lourve and the E. Tower are on are list, but was feeling a bit overwhelmed with the prospect of…. your notes make is seem manageable. Even enjoyable! Thank you. Now to find a place to stay….! 20 hours ago by motherofalltrips Window, Mystic.